The NSF is the same group that reports that there are no known health risks from chloramine! 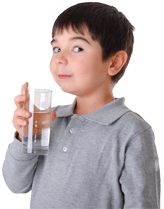 Why would someone who is totally convinced and very concerned about health problems from chloramine – then rely on the same organization to tell you about water filters for that same contaminant? It defies logic. One must use some common sense too. The NSF does provide some usable information. For example, all of the water filter media we use in our filters have been certified to NSF standards. And all the filter media used in our whole house and kitchen canister filters have been directly certified by the NSF. On that page above, they are exactly right that you need to understand that filters that take out chlorine does not at all suggest that they will work for chloramine – which is harder to remove. However, they list carbon as a media to filter chloramine. True, but it should be the right kind of carbon, which is catalytic, and you need really a lot for carbon to do much by itself. They don’t mention that if you run the water through kdf 85 first, it breaks the bond between chlorine and ammonia – which are then both readily absorbed by carbon. So the info there is not exactly wrong, but there is a far better way to filter chloramine than simply using carbon. The Water Quality Association reports that: Chloramines are small, stable molecules with no net charge making them difficult to remove by distillation, reverse osmosis, and ion exchange resins. Again this is true. Combining kdf with catalytic carbon works best. There is a similar issue with fluoride. The NSF cites potential health risks to include skeletal and dental fluorosis. That’s true. But it’s also been well established that there are risks to the thyroid as well, and many other studies have shown health risks of many types. To learn more see this page: No Fluoride. The Water Quality Association cites Activated Alumina as the most effective media to remove fluoride. And it is. The NSF doesn’t even mention it. We don’t certify all the different filters in which we use already-certified filter material. Each test and certification would cost several thousand dollars and each one costs additional thousands each year to continue to use the NSF label on that item. And we have many different combinations. Wouldn’t you agree that it makes more sense to keep the filters more affordable instead?